The Futaba GY240 Gyro – Basic Can Still Be Best! So why would I possibly recommend the Futaba GY240 gyro when so many others say not to waste your money on 240 when a Futaba GY401 is so much better for only 20 bucks or so more? 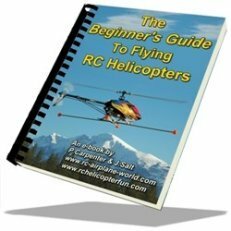 Simple really – sometimes the basics are best, this holds especially true if you are upgrading an old mechanical gyro or don’t have a computerized programmable radio. 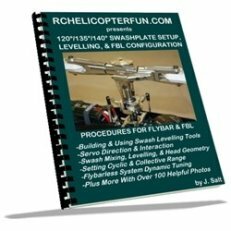 Perhaps you are just flying gentle scale and don’t need the ultra high speed digital output or need that extra channel for something else more important to you then remote gyro gain adjustment. It all adds up to the GY240 still being a very good gyro that offers the same heading lock performance of the GY-401 but works with non computerized radios. 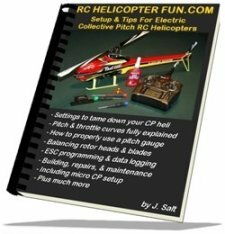 I am using a Futaba GY240 in the Scale Bell 222 and have been so happy with it. I do use a GY-401 in my X-Cell Fury and to be honest the 240 & 401 are almost identical in performance (in analog mode of course). Sure if I was into 3D, the 401 would show its digital edge, but for a sport and scale guy that is not the case. The GY-240 will work well in 400 size electrics up to 90 size nitro’s. The GY240 is basically a GY401 without all the bells and whistles; a good solid little gyro that you can set and forget about. AVCS (Angular Vector Control System) is Futaba’s patented heading hold gyro technology. AVCS works better than other HH gyro systems at correctly compensating for and eliminating drifting issues in heading lock/hold mode caused by temperature changes within the gyro. 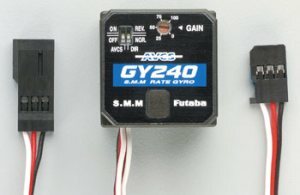 The GY-240, just like all of Futaba’s AVCS gyros uses a SMM gyro sensor and is said to be better than other conventional solid state yaw sensing technologies since all the electronic components are combined on a single chip improving performance and reliability. SMM stands for Silicone Micro Machine. The gain setting on the Futaba GY240 can only be adjusted on the gyro; no remote gain function is supported. As I mentioned, this means that you don’t need a programmable computerized radio if you are still using your old trusty friend and refuse to go computerized. No Fast Digital Output – The GY-240 works best with analog tail servos.